During this year’s World Health Assembly, which took place on May 21-26, 2018 in Geneva, Switzerland, world health officials were stunned by the United States’ apparent attempt to overturn 40 years of consensus and scientific evidence about the best way to protect infant and young child health. According to a recent report from The New York Times’ Andrew Jacobs, US officials allegedly sought to remove the language encouraging global governments to “protect, promote and support breastfeeding” along with another passage calling for policymakers to restrict the promotion of food products that might harm children. According to the article, Ecuador had planned to introduce a bill proposing an international resolution that encourages breastfeeding but backed out after being threatened with retaliatory trace measures and the withdrawal of US military aid. It was also reported that the US allegedly threatened to cut its financial aid to the WHO. 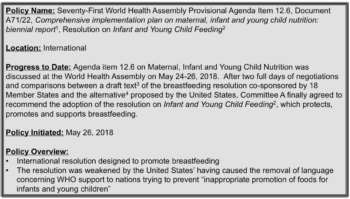 Eventually the US agreed to the international resolution that encourages breastfeeding when it was supported by Russia, but did successfully remove language providing WHO support for nations trying to prevent “inappropriate promotion of foods for infants and young children,” and added the phrase “evidence based” to certain provisions. This resistance to the promotion of breastfeeding has been cited as the “latest example of the Trump administration siding with corporate interests on numerous public health and environmental issues,” and the Times article discusses multiple examples of the United States having having seemingly prioritized business interests–in this case, the $70 billion baby formula industry–over public and environmental health. Another example includes the Environmental Protection Agency’s repeal on the ban on pesticide chloryprifos. At the federal level, the U.S. Environmental Protection Agency (EPA) banned the indoor use of chlorpyrifos in 2000. More recently, based on further research into potential health hazards, the EPA recommended banning the chemical from agriculture completely and permanently nationwide. However, despite the agency’s own research showing that children are exposed to unsafe levels of chlorpyrifos in drinking water in some parts of the country, that residues of the chemical on food crops have been found to exceed federal safety standards and that the chemical endangers marine life, the EPA has refused to finalize the ban on chlorpyrifos. The failing NY Times Fake News story today about breastfeeding must be called out. The U.S. strongly supports breastfeeding but we don’t believe women should be denied access to formula. Many women need this option because of malnutrition and poverty. Opponents, however, believe that no one is saying women should be stigmatized or that they shouldn’t be able to decide for themselves. They simply say that mothers should be provided with all the facts so that they can make an informed decision. Mothers may supplement with formula because of issues with lactation and latching, concerns about the infant’s nutrition and weight, perceived cultural or familial norms, or hospital practices and policies promoting infant formula use. While some mothers may experience difficulties with breastfeeding or prefer infant formula, the overall scientific recommendation does not change — particularly for mothers who are unaware of the benefits of breastfeeding and would breastfeed if they were better informed. Further, the use of formula that comes in powder form and must be mixed with water can be especially problematic in the developing world where clean water is often difficult to come by. Iif the water is contaminated, the infant’s health will be put at risk. In addition, formula is an expensive option compared to breastfeeding, which is free. This then begs the question: Why did President Trump state that infant formula is “needed because of malnutrition and poverty.” Mothers who are are malnourished may, of course, experience difficulties with lactation and choose infant formula as a result. That, however, raises yet another important public health issue. Rather than offering infant formula as the only option for malnourished mothers, why don’t we provide the necessary tools and a supportive environment, such as an adequate supply of nutrient-dense foods, that would make it possible for these women to breastfeed. By doing that, we would kill two birds with one stone: improving the health and nutrition of both the mothers and their newborns. The American Academy of Pediatrics (AAP), the World Health Organization (WHO), the United Nations International Children’s Emergency Fund (UNICEF) and the Center for Disease Control (CDC) all recommend exclusive breastfeeding for the first six months of life, followed by continued breastfeeding combined with the introduction of complementary foods until at least 12 months of age, and the continuation of breastfeeding for up to two years or more. These recommendations are based on an established body of evidence demonstrating that breast milk is nutritionally, economically and ecologically more sustainable than formula. Despite these international recommendations, however, according to the CDC’s 2016 Breastfeeding Report Card, only 22.3 percent of infants were breastfed exclusively through 6 months. The protective effects of breast milk are attributed to its unique composition of macronutrients, minerals and vitamins necessary for the optimal nutrition, growth and development of the newborn infant. Further, breast milk contains several bioactive compounds including IgA antibodies, HMOs, beneficial bacteria and long-chain polyunsaturated fatty acids (“healthy” fats) that support the development of the immune system and aid in the maturation of the infant gut to protect against infection and disease. The long-term benefits for the newborn include fewer sick days, decreased incidence of obesity, reduced risk of allergies and, potentially, reduced risk of autoimmune conditions such as type 1 diabetes. And, along with providing benefits for the newborn, breastfeeding also provides many protective benefits for the mother, including a decreased risk of cancer, cardiovascular disease and type 2 diabetes. Human milk oligosaccharides (HMOs) are soluble carbohydrates highly abundant in human breast milk. HMOs have been receiving much attention lately due to their potential benefits in infant immune development by serving as a natural defense against pathogens and viruses during the breastfeeding duration. The gut of newborns is functionally immature and permeable at birth. The abrupt introduction to life outside the uterus and exposure to environmental pathogens given a permeable and undeveloped gut leaves the newborn in a state of vulnerability and increased risk of infection. Closure of the gut begins during the first postnatal week but may be delayed or altered by several factors, one being feeding method. Gut permeability has been shown to decrease faster in breastfed infants compared to formula-fed infants resulting in gut maturation. HMOs have also been demonstrated to serve as natural prebiotics (the food for bacteria commonly known as probiotics) by selectively stimulating the growth of specific beneficial bacteria for a healthier infant microbiome. HMOs are only found in human milk and therefore are not found in infant formulas, suggesting a potential mechanism for the observed differences in immune integrity between breastfed and formula-fed infants where there is a reduced incidence of viral infections found in breast-fed infants compared to formula-fed infants. It is important to note that the decision to breastfeed is not always simply a personal choice. Especially in the United States where working mothers must quickly get back to work, breastfeeding can be a challenge, particularly for mothers who are just making ends meet or don’t have the luxury of taking time off from work without pay. We must recognize the social and economic realities that influence the number of viable options for mothers who are not only trying feed their children but also themselves and other members of their families. Apart from social and economic reasons, mothers may also not be able to breastfeed due to poor milk production or other physical reasons. Mothers who are unable to breastfeed should not feel guilty, because there are several other methods they can use to bond with their child and ensure healthy growth. Stigmatization of mothers who feed their children infant formula should be reduced along with the stigmatization of mothers who breastfeed in public. Public health professionals and advocates should create a supportive environment for all mothers, providing sufficient education and resources on both breastfeeding and infant formula in order to the support optimal health of our next generation.